The harbor was originally built as the yachting venue for the 1964 Tokyo Olympics. On June 1st 2014, the new Yacht Clubhouse opened, and this 2-storey building features a wave-inspired roof design. The harbor was originally built as the yachting venue for the 1964 Tokyo Olympics. On June 1st 2014, the new Yacht Clubhouse opened, and this 2-storey building features a wave-inspired roof design. 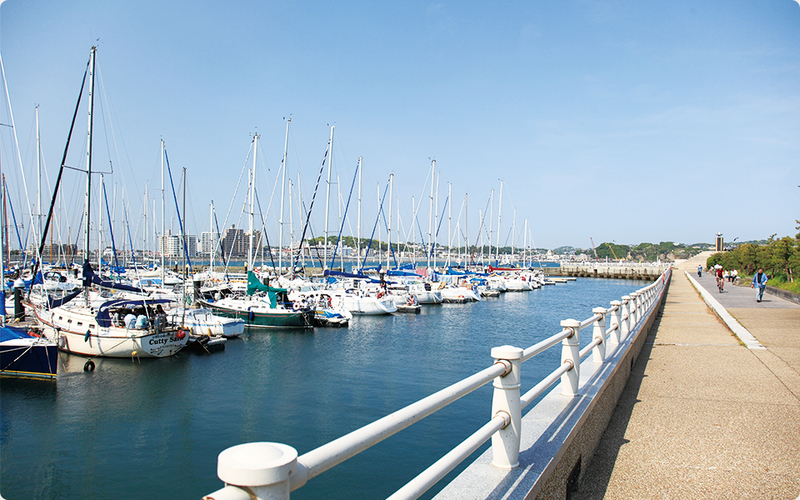 Shonan Port is a pioneering public yacht harbor which hosts a number of yacht races each year, and has contributed greatly to the spread of yachting in Japan. At present, around 1000 yachts are moored here. Following on from the 1964 Tokyo Olympics, the harbor has again been chosen as the venue for the sailing competition during the 2020 Tokyo Olympics. The Center Promenade has been built as an inclusive recreation area from where anyone can enjoy watching the yachts glide in and out of the harbor. In addition, adjacent to Shonan Port is a fishing area popular with anglers and which provides ideal sea fishing conditions.